Giving a weather app permission to access your GPS information seems reasonable. Some apps’ collection of that geolocation data, however, gets too close for comfort. 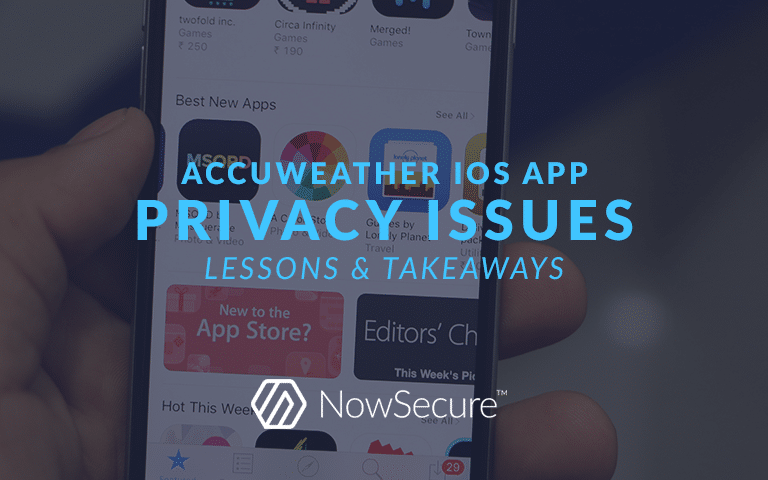 AccuWeather, and its app for iOS, recently received a public flogging for their mobile app’s privacy practices. We don’t feel the need to pile on. But, a core aspect of the NowSecure mission is helping organizations protect themselves by maximizing the security of the mobile apps they use and the apps they develop for their customers and themselves. Because our clients take mobile app security, compliance and privacy seriously, we wanted to provide a quick summary of the incident with a few lessons on critical best practices. It’s obvious that GPS data can identify a user’s location. A lesser-known fact is that a user’s BSSID and free tools available on the Internet can also identify a person’s location within a few meters. The AccuWeather iOS app sent that data along to a third-party service provider for advertising purposes. The researcher also claimed that despite opting-out of location services within the app, the BSSID was still sent to the third party. In 2016, the Federal Trade Commission investigated a mobile advertising company, InMobi, for collecting BSSID data from mobile devices without users’ permission. A settlement with the FTC included a $4 million fine for InMobi (reduced to $950,000 due to the company’s financial circumstances) and a requirement for an independent audit of the company’s privacy program and practices every two years. If you develop a mobile app, make sure you’re explicit about the data you collect and its destination. A number of federal agencies, the FTC chief among them, don’t shy away from investigating a company’s security and privacy practices if they suspect any discrepancies between a company’s statements and the facts (see InMobi, Snapchat, Wyndham, and most recently Uber). 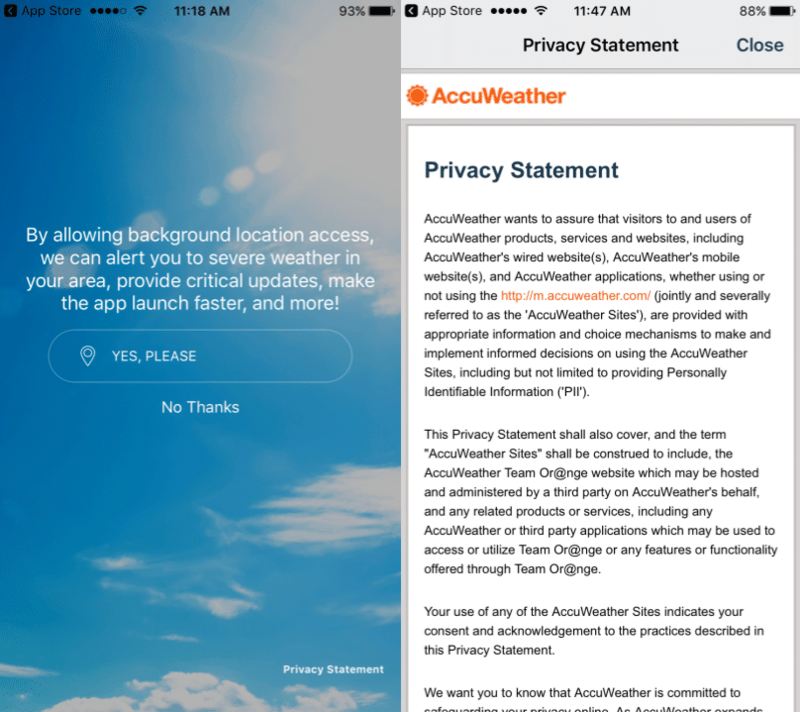 AccuWeather claimed they were unaware that the Reveal Mobile SDK had access to the location data in question. The FTC won’t likely accept ignorance as an excuse when investigating the potential violation of consumer privacy. Make sure you have complete visibility into your apps’ security, compliance, and privacy practices by performing regular mobile app security assessments and penetration testing. Only NowSecure fully automates mobile app security testing to identify the broadest array of security issues, privacy problems, and compliance gaps in custom mobile apps — and faster, deeper, and with more accuracy than any alternative. Do those third-party components properly secure the data they handle? Where is that data sent and stored? In sensitive verticals, including government, preventing the tracking of an employee’s location might be mission-critical. A number of apps, or third-party SDKs integrated within them, may not make some of their functionality obvious or explicitly ask permission to collect and/or share data about a user. Financial institutions, government agencies, and other enterprises can’t count on just app store reviews. They need more thorough vetting of third-party apps to ensure they comply with internal and regulatory security standards. To provide organizations with deeper visibility into the security, compliance, and privacy status of Apple App Store and Google Play store apps, we’ve extended the NowSecure Platform to provide “AlwaysOn” mobile app vetting for third-party mobile apps with our new NowSecure Intelligence™ product. If you’re interested in early access, apply now. It’s clear we all need to remain aware of the data collection and sharing that occurs under the surface in custom, third-party commercial, and business-critical mobile apps. To learn how NowSecure and the NowSecure Platform can help you manage mobile app security risk and more specifically audit your app’s collection of user data, e-mail us at [email protected] or fill out our contact form.